Find Your Car's Center of Gravity! The center of gravity. Why do I need to know this? If you are running a 4-link rear suspension system, and want to tune it to run at the track, it's good to know where the center of gravity is for your car. It's not hard, and it's kind of neat to know exactly where it is on your car. There are 2 ways to find it. The first way requires 4-wheel scales. The second way just uses a drive-on scale like at the race track, truck stops, a farmers CO-OP, etc. 1. Get your car ready. Driver must be in it, all fuel, nitrous bottles, air pressures set, etc. 2. Write down the weights for the front, then write down the weights for the rear. You're not looking to add all of them, you just want the weight for the front of the car, and the weight for the rear of the car. 3. Write down the wheelbase of the car. (Center of front wheel to center of rear wheel). 2. Somewhere on the bottom of the car (like the driver's rocker panel) where you or a friend can see, make a line. A piece of masking tape works well. 3. Now drive onto the scale until the edge of the scale is even with your line. Your front tires should be on the scale with your rear tires off of it. Now write down the weight. 4. Now pull over the scale until your front tires go off the scale and the other edge of the scale lines up with your line. Now the rear tires should be on the scale, and your front tires are off. Now write down that weight. 5. Write down the wheelbase of the car. (Center of front wheel to center of rear wheel). Let's say the front end weighed 2000lbs.Let's say the rear end weighed 1800lbs.And the wheel Base is 108". First add the weights together. 2000 + 1800 = 3800lbs Don't worry if this isn't the real weight of your car. It can vary due to unlevel ground, etc. It doesn't matter, as we are only interested in the weights of the front and back. Second, divide the front weight by the total weight you came up with. This will be the front weight percentage. 2000 divided by 3800 = .526 So rounded up, your front weight percentage is roughly 53%. 1800 divided by 3800 = .473 So rounded up, your rear weight percentage is roughly 47%. So front is 53% and the rear is 47%. Third, take the front weight percentage and multiply it with the wheelbase measurement. 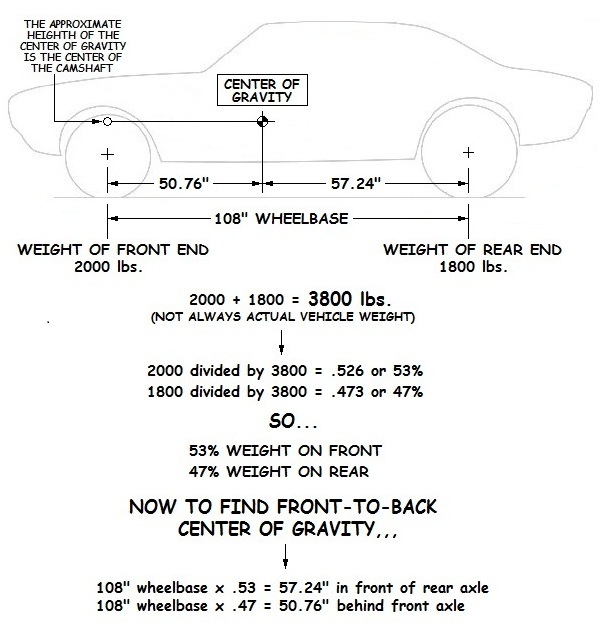 .53 x 108" = 57.24" So the Center of Gravity is located 57.24" in Front of the Rear axle. 108" x .47 = 50.76" So the Center of Gravity is located 50.76" Behind the Front axle. It seems kind of backwards, but that's how you do it. Just follow what I have written here... If you did it right, both measurements will put the center of gravity in the same place. Now, to get the height of the center of gravity, measure the distance from the ground to the centerline of the camshaft.